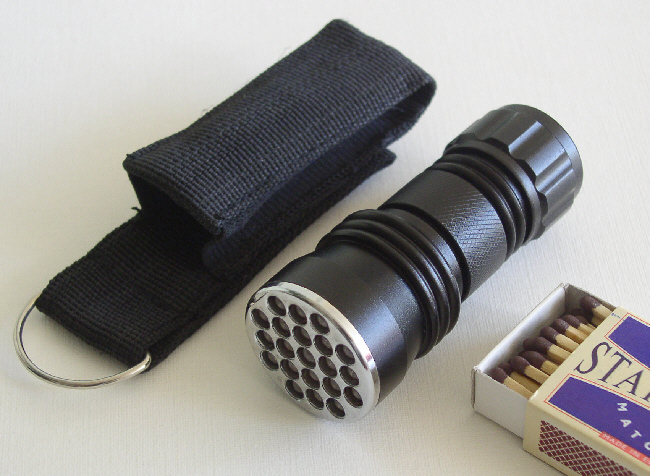 Ver nice black aluminum flashlight with 21 undestructable leds, runs on three AAA batteries. Very nice design, good engineering. Good grip due to rubber sleeve, with 'tears' pattern. Twentyone 5mm high efficiency leds give an extreme powerful beam. A flashlight for professionals. Extremely compact at a lenght of only 90mm. Batteries and holster included.